Four provincial coordinators and an executive committee member of the South African Waste Pickers’ Association (SAWPA)  from Sasolburg, Vereeniging, Mafikeng and Pietermaritzburg will spend a week in Barcelona, which has increasingly become the hub of recycling and composting in the country. Like many towns across South Africa, in Barcelona waste picking is a socio-economic phenomenon that has increased over the years due to growing poverty and the economic vulnerability of these marginalized people. Zero Waste Europe  and GAIA  will be hosting the waste pickers in Barcelona and these organizations promote adopting a zero waste approach to resource management as critical to creating employment and mitigating climate change. In addition, this Friday, as part of a global campaign under the banner Reclaim Power  there will be a day of action to stop the incineration of waste, which is of growing concern in South Africa as waste-to-energy incinerators are being proposed across the country, which lead to an increase in GHG. Whereas in South Africa very little composting of organic waste takes place by pickers and focus is more on plastics, cardboard, glass etc., in Barcelona this is a large component of their recycling. Therefore, the aim of the visit is for these waste pickers to demonstrate how this type of waste recycling takes place in order for South African waste pickers to further their work towards zero waste. 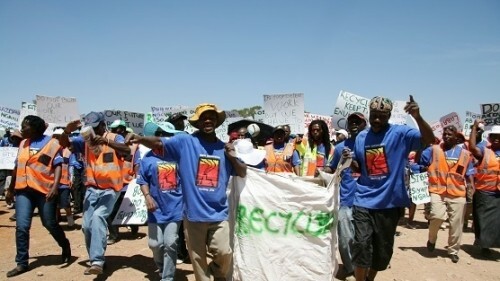 The South African Waste Pickers’ Association is a national movement of people working on waste dumps and in streets collecting waste and earning an income from selling this waste material for recycling. It has over 10 000 affiliates from all provinces, except the Northern Cape.